Have you learnt French in high school and are now looking to pick it up again? Do you have an advanced level of French and seek to maintain your level ? I’m Jessica, a native French teacher from the Champagne region now based in Melbourne, Australia. This page is to help you get around my site. Click here to find out more about me! I’ve created a lot of free content to guide you with your French learning. There are multiple ways to learn French and I invite you to dive deeper into the parts that you feel will help you create your own learning experience. There is something for all levels of French, and much more coming out regularly! I have written (and will continue writing) articles and tutorials to assist with your French learning. Some of them come with free downloadable worksheets or checklists which you can print out for future reference or to get practice with the exercises. I recommend that you start with the articles below. After that you can then explore the other articles and tutorials that I’ve written depending on your interest. 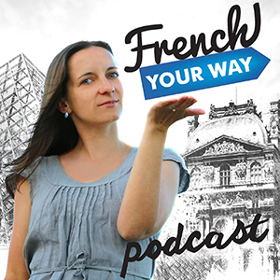 If you are curious about the French language, French Your Way Podcast is for you! The weekly episodes are designed to help you expand your French vocabulary, improve your French grammar and get a new understanding of common mistakes made by students of French. A new episode is released every Wednesday. Find out more about French Your Way Podcast. Or go directly to the episodes. You can subscribe to French Your Way Podcast in your podcast app to automatically receive the latest episodes. If you have a question related to French, you can ask me by recording your message below. Your question may then become a French Your Way Podcast episode! 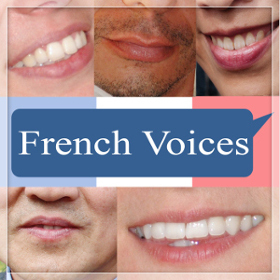 French Voices Podcast is a great way for you to work on your listening skills and at the same time discover a slice of life and of French culture. I have interviewed passionate French-speaking people about their professions, passions and lifestyles. Vocabulary lists and comprehension questions are included for free with each episode (see the shownotes). The full transcripts for the interviews are available for a small fee. Read more about the podcast. Or go directly to the episodes. How to Find Other Ways to Learn French? Are you studying French by yourself or looking for a complement to help boost your learning? Apart from the free content that I’ve been putting on my site, there are some other ways for you to start or improve your French. Michel Thomas’s method for learning French. Linguist Michel Thomas was not a native French speaker but he mastered ten languages in his lifetime, so he really was an expert in the field or language-learning. He had a very innovative way to teaching languages that has also inspired me in my teaching. I’ve recommended it to my students and now they rave about it too. Duolingo is a great free resource to learn a language by yourself or to complement your lessons (you can choose to study a wide range of languages). The lessons allow you to learn new vocabulary and to reuse it in sentences you need to translate (the beauty of the program is that it’s smart enough to accept a wide range of answers. That’s quite a revolution, even though it is not 100% perfect.). Like in a video game, you can lose lives if you make too many mistakes and you will have to repeat a lesson if you lose all of them (your lives, not your mistakes!). Many of my students have become addicted to Duolingo, and some of them have even started to compete against each other! (you can also challenge yourself and reace against the clock). Duolingo is available on your home computer or as an app for your smartphone/tablet, so you won’t have any excuse for not trying it! Whether you are already taking French lessons or learning by yourself, make sure you have a good teacher in your area (or look online) with whom you can communicate well. To get your motivation and enthusiasm going, it is very important to receive the right kind of guidance (whether it’s on a regular or occasional basis). I know that there are great teachers out there, I’ve met a quite a few in my journey. Don’t hesitate to contact me if you have any suggestion, feedback or question. I’d love to know about them and will be happy to help if I can. There will be many more great content articles, tutorials and lessons to come, so be sure to sign up to my newsletter not to miss the monthly updates ! If you have found my site useful, please share it with your friends so they can benefit from it too. Merci beaucoup! Expand your French vocabulary. Improve your French grammar. Discover the origins of some French words and French expressions, examples of related words and get a new understanding of common mistakes made by students. A series of interviews where native French speaker share their passion. Complete with free transcripts & study materials. For the more advanced French learners keen to improve their listening skills. Free articles, tutorials, worksheets, cheatsheet and recommended reading list to help boost your French learning experience. For all levels of French. Note: the Amazon links above are affiliate links so if you choose to buy Michel Thomas’s method through them, I will earn a tip at no extra cost to you! Thank you so much!